I will introduce one of Japanese living arts Origami (paper folding) and Froshiki (wrapping cloth). Both are traditional Japanese culture using only one sheet of paper or cloth. 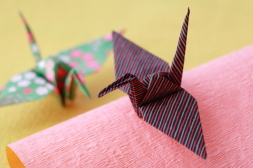 Origami is a traditional Japanese play to make animals, flowers or ornaments by folding a sheet of paper. We use square shaped colored paper. The paper is also named Origami. Chiyogami, the beautifuly decorated paper printed on Washi (Japanese paper) is also used for Origami. It is said that Chiyogami was first made by Ukiyoe artist. Exceptionally, we sometimes use rectangular paper and scissors. Origin of Origami is not certain, but there is a written document which says birds and flowers were made by folding paper. The typical things that children can make comparatibly easily are crane, airplane, ship, samurai helmet, throwing star, snac container, house, baloon, servant of samurai and so on. The master can make complicated things with high technology. Other than playing Origami, there is Ceremonial Origami which is used with gift. Furoshiki literally means the cloth for bathing. People used to take off their clothes on it and wrap their clothes with it. In Muromachi era (14-16th century) only feudal lords used, but in Edo era (17-19th) because public baths were built all over, Furoshiki spread among common people. As it can wrap various things, it became to be used in many occasions other than when bathing. The feature of Furoshiki is that it can wrap the things regardless the shape and size. We can fold it in small peace when not in use. We can wrap, bedding, clothes and even glass bottles. We also use it to wrap the gift. 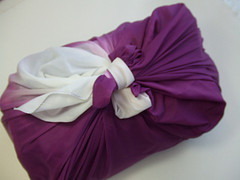 By the way, when wrapping money, we use Fukusa which is like a small Furoshiki. After western bags began to be introduced in Japan in late 19th century, Furoshiki declined, but today, with the movement of ecology, it again attracts attention as substitution of plastic bag. The material used to be silk or cotton, but now many chemical fiber is used. Some are painted with natural beauty or small patterns, some are woven the stripe or check pattern with dyed thread. Colors have meanings, red or vermillion is used for celebratory occasions, indigo blue for feuneral and purple to express the respect.